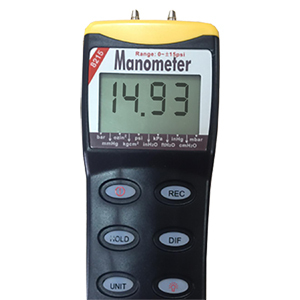 The HHP8200 Series are low-cost handheld manometers capable of measuring differential pressure and positive or negative gauge pressure. Five models are available covering ranges from 0-345 mbar to 0-6.9 bar. All models feature user selectable engineering units, MIN/MAX memory, and a bright back-lit display for easy viewing in low light conditions. Nota: Comes complete with 9V battery, connection hose, hard carrying case and operator’s manual.